Georg Christoph Wagenseil was born in 1715 and through his family connections with the Viennese Imperial court seemed destined to have a career that would involve him in that society"s affairs. He was a well-known keyboard virtuoso, serving as organist at for the widow of Charles VI (the Empress Elisabeth Christine) for 9 years during the 1740s. He was also appointed court composer in 1739 which post he kept until his death in 1777. 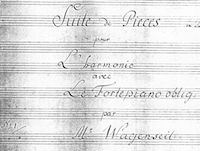 Wagenseil's compositions ranged from opera, through numerous symphonic works and concertos, to keyboard pieces. 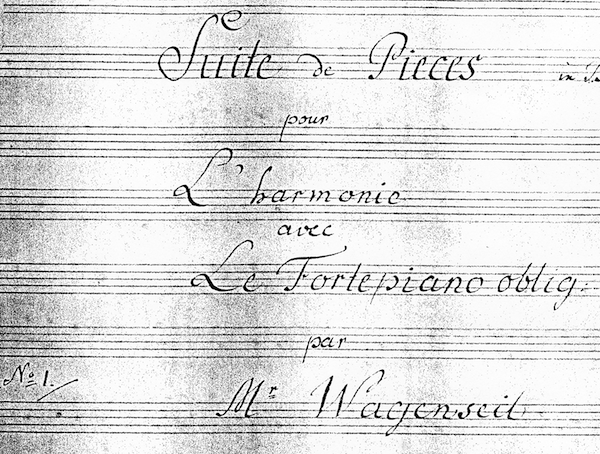 The young Mozart played one Wagenseil's keyboard concerts before Maria Theresa when he was 6 years old, and Haydn was familiar with his compositions. Grove lists 7 divertimento for wind and an octet Partita. However this set of Suites is not included. They are a curious set of pieces written for the unusual combination of keyboard and Harmonie (sextet). They are very short and it is not clear why they were written but probably as a commission. One other possibility is that they were teaching pieces. The wind writing throughout the 5 pieces is simpler than what one would normally expect of Harmonie music of the day, and should be mastered by most competent students. The keyboard part has a much more florid line and could almost be played in isolation as the wind parts, in general, double the keyboard part. In the audio excerpts below the entire suite is given rather than each movement. The PDF is the first 3 pages of each Suite.